The poor old sand eel lives a life not unlike the minnow – constantly looking over his shoulder. 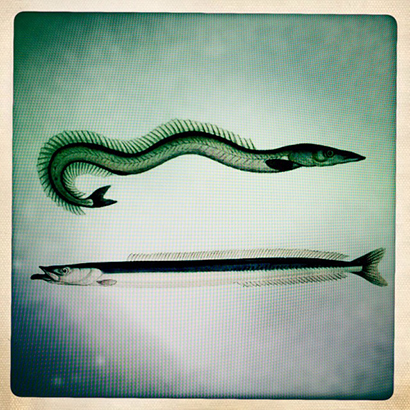 There are two species common in British waters, the lesser and greater sand eel – and it is the lesser (Ammodytes tobianus) that plays such a key role in the food chain. Just about everything bigger than the lesser sand eel wants to eat him. Fish from the size of small scad and mackerel, to sea birds such as the puffin and guillemot. They are small fish that rarely venture into deep water and bury themselves in the sand when endangered. While the greater sand eel (Hyperoplus lanceolatus) – also known as the launce – is encountered by anglers, the lesser has not had a place in the fishing industry until relatively recently. Its use in fish based animal feeds has put stocks under pressure, and the populations of birds dependent on it have crashed in some areas, while the impact on other fish is harder to gauge but potentially disastrous. Such a humble little fellow, and yet probably the most important fish in our seas.